Fifth-grade witch April Appleton can't believe her eyes: a boy just made a large tree branch fall on her dad's car in the middle of the night! When she gets to school, the mayhem continues, the heat is cranked way up, birds are flying through the hallways and there's a boy standing in the corner quietly observing all of it. While her friends try to help, April trust in the magical powers of herself and others to make things normal again. Talia Aikens-Nuñez dreamed of being a meteorologist as a child because her head was always in the clouds. 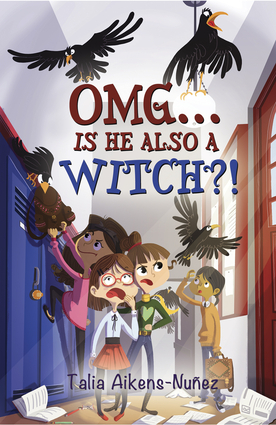 It was her imagination and her fun-loving, second-grade daughter that inspired her to write her OMG series about an accidental witch, now with three books. She and her husband live on a river in Connecticut with their daughter and son. When Alicja Gil was a little girl, people called her "Alice from Wonderland" because she would sit with her books admiring the beautiful pictures inside and dreaming. Now she's grown up, her dream has come true and she now illustrates children's books. Alicja knows that if you dream and try hard enough, anything is possible!